Modern, classic, and timeless all at once, Kate Aspens Gold Dipped Pyramid Place Card Holder is wedding reception table decor item that really stands out! 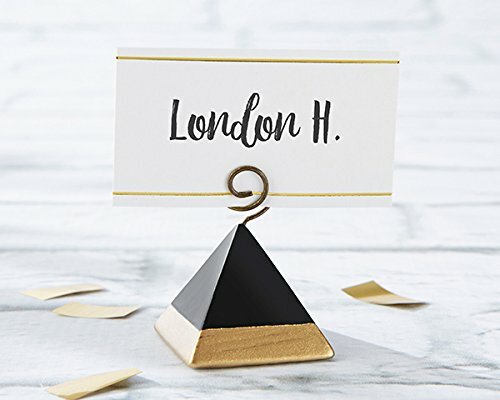 Each artsy place card holder comes equipped with a matching cardstock place card, and is made from resin to hold up throughout a whole night of celebration. The set of 6 place card holders are perfect for all sorts of themes, and all sizes of weddings! Black pyramid place card holder with spiral top and gold dipped lower border. White place cards with gold foil lines at top and bottom included.